T.A.N.K. 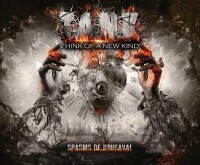 is a new, French, modern Metal band, formed in 2006. T.A.N.K. stands for THINK OF A NEW KIND. What that “kind” is, could be anything: a new kind of Metal, a new kind of vision on music, a new kind of life (musical most likely, as we’re dealing with a group of musicians here), etc… Anyway, in the early stages the musical influences shift between CHILDREN OF BODOM and IN FLAMES. After the release of a 2-track EP called “TANK”, the band continues to develop its style, wins the Wacken Metal Battle in France and even gets to share the stage with, for example, MACHINE HEAD, IN FLAMES and DOWN. Anno 2010, it’s time to put out a first album: “The Burden of Will”. T.A.N.K. gets several positive reviews for it and gig-wise the stage is shared with e.g. SYBREED, HACRIDE and GOROD. Anno 2012 then, on the 9th October, the follow-up is ready and available under the title “Spasms Of Upheaval”. On this album, the band is said to be influenced by SOILWORK, MNEMIC, IN FLAMES, PANTERA, MACHINE HEAD, and so on. Jon Howard, vocalist of THREAT SIGNAL, is featured as a guest vocalist for the song “Inhaled”. The album begins with an intro, “Life Epitaph”, in which the guitar plays a key role. How it sounds? A bit Djent-like. See, for example, TESSERACT. Drums are added to increase the tension. Direct contact is established in “The Raven’s Cry”, where Melodic Death Metal is the musical direction. The production is clear and powerful. Pounding, groovy verses (with a very nice rhythm, by the way) with screams link with a melodic chorus, where the singing switches between clean and aggressive. After the instrumental, melodic transition, more instrumental talk is done (solo and otherwise). So far, so very good. Melodic Death Metal pounding is on offer in “Unleash The Craving”. Drumwise you get blasts and skankbeats in the verses, so things do advance quite firmly. The chorus reminded me of old IN FLAMES, which is good. I’m not fond of the contemporary version of the band – or rather, their music. “Unleash The Craving” is a catchy song and again allows the music to do some talking as well, especially in the last part. The title track is another nice track, building first, then taking off with midtempo grooves and leadwork. The singing is again done in two versions and mainly in the chorus you cannot deny the contrast that is created. However, I wouldn’t consider this song a highlight. “Through The Disgrace” is, on the other hand, another highlight. Starting clean, as if something will burst soon. And so it happens: Melodic Death Metal on a plate! The dual leads are well done and smoothly connect with the aggressive verses, where rhythm is key. Clean vocals make the bridge to the melodic chorus where screams rule the vocal department. A groovy, rhythmic passage paves the way for the solos. Time for another round of blasting Melodic Death Metal in “Inhaled”. And once more the skankbeat(en) verses are present as well. Speaking of drumming, Clément Pouxel sure has a lot of stamina and skill. A pounding Metalcore bridge leads the way to the melodic and rather meotional chorus, where both vocal types share the burden. There’s even room for a breakdown. Strangely enough I had to think of LINKIN PARK as a certain part, later in the song, was played, after the solo moment. In any case, the music is fine here, but the screaming does start to annoy. “Slumber” is an atmospheric, Industrial intro, featuring a ticking clock; a reference to the cover art? This links directly with “Conflict”, a groovy, midtempo song with extreme vocals. Rhythm is again of high importance, though there are melodic touches (less then before). The guitar introduces “Stillness Withered” and it works towards an outbreak, which reminded me of ARCH ENEMY. The rapid verses are similar to IN FLAMES, DARK TRANQUILLITY, etc. Applying the same recipe as before: the melodicness of the chorus. Here clean singing and screaming work together. As a final note, the guitarwork is outstanding. More Djent-like guitarwork is to be found in “A Life Astray”. Pounding verses now also contain melodic input. The calm, clean break at some point does come as a surprise and the difference with what preceded couldn’t be bigger! Afterwards it’s back to business as usual. Musically, no complaints from my part whatsoever. T.A.N.K. do a very good job here and in the other songs. The screams, on the other hand, do get boring. It’s like Raf Pener is in constant agony. Another modern sounding song is brought as “Cryptic Words”. After the intro, midtempo groovy Metal is unleashed. Vocals are as usual, but when the clean voice and screams combine forces, it sounds weird/strange. The chorus is, for the sake of change, of the aggressive kind. Last but not least but not a highlight either, is “Daze”. Beginning in a subdued fashion, the fast, Thrashy Metal the breaks out with full force. And this time the bass gets its moment of glory, rattling out of the speakers. The verses hold the screams, while the bridge is where clean singing takes place. And it sounds… weak. The song does have a catchy rhythm. Again, musically these guys play good stuff. Both vocal types also reside in the melodic chorus. The clean break later on is very welcome and relaxing after the heavy and violent ride. But here comes the clean singing again, which – I’m sorry to say – sounds gay (by lack of a better word), followed by a slab of emotional Metal. All ends with clean, undistorted music. It’s always nice to hear new bands, what they have on offer. T.A.N.K. is a force to reckon with, without question. “Spasms Of Upheaval” is very well produced, clear and powerful with songs that are not for the faint of heart. Musically, things flow really well. Vocally, the band mixes screams and cleans, to offer change where possible. But that change doesn’t always work well, doesn’t always fit. Maybe it’s a taste-related matter, maybe it isn’t. However, the impact is too small to not declare this album a must-buy. So, if you’re looking for powerful, modern Melodic Death Metal, then “Spasms Of Upheaval” is to be added to your collection.